More than anything, I was proud to be part of Dream Team LA and everyone that was part our our graduation and all the other graduations across the country. With some many people synchronized and united in the same cause, I know we raised a lot of attention because of the sheer coordination it took to have everyone on the same page. Yet, there are thoughts and feelings in the back of my mind. I wish I could be as optimistic as other people, but the fact of the matter is I'm still in the same place. As much marching and calling we do, I'm still here, at work the next day because the reality of things is that I need to survive. I need to take care of my business in order to have the opportunity to be part of monumental events like the graduations. I'm realizing this is one of the main reason I was such a loner in the past about things like this. How can we know the heights of joy without experiencing the depths of grief ? It's bitter sweet. 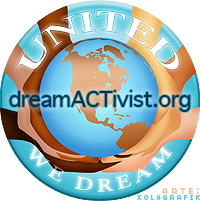 We get our hopes up, knowing that today we may have influenced another person or politician into realizing that the DREAM Act is needed. We can only do soo much before it's out of hands and in the hands of the faiths. I think that's the hardest part for someone of us. We are getting older everyday, our windows of opportunity are passing us by with every waking moment. Our lives on hold because of the challenges we have to over come. I'm starting to fear that for some of us, desperation will set in and lead them to make hard decisions. Decisions they never wanted to make but are doing because it's almost the end of the line. 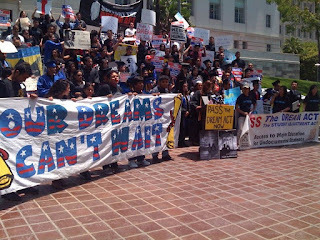 I cringe at the idea of being 30 and still being undocumented. Still not able to have a regular job or any other of those things. Time is passing us by and I am thinking of what I need to do in order to make things happen. 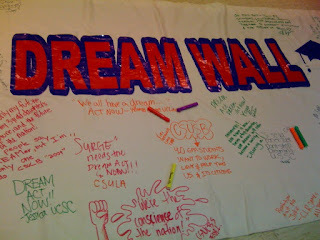 To go to places I didn't want to go to because I have faith in the government and politicians passing the DREAM Act. That faith is wearing out more and more everyday. Suddenly ideas I had about doing certain things for citizenship are looking like last resorts. I hate having a job I can utilize my full potential. I hate that the world is moving and growing while I'm still in the same place I have been since I first got here. I begin to wonder if I was such a horrible human being, that I was born to suffer. To live my life this way because of past sins. Sometimes I don't even k ow what to think because it leads to the dark recesses of the mind. The ones we ignore and keep at bay. No matter how much we do, at the end of the day, we'll be where we were. In purgatory. Neither heaven or hell. 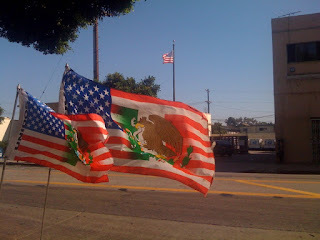 liked everything but the mexican+american flags. Yeah, you need to get rid of that pic of the destroyed American flag.It's wrong in so many ways..... and only hurts your cause like you have no idea. defacing the American flag is a criminal offense. Your blog has been reported to the authorities. hahaha that picture has nothing to do with the DREAM Graduation. I took that pic at a second hand store. I don't agree with what it is, but I like what it is and what it stands for, confusion. There are soo many sides to the immigration debate that people tend to ignore what people think and how they really feel. This flag is a perfect example of that. Here you guys are saying that I should take that pic down, yet the store owners are proud to have and sell that flag because that's the way they see things. And there's nothing the "authorities" can do about your picture, E. Thank you for not taking it down and bowing down in the face of intimidation. Anyhow, I feel like there's nothing I can say. I can't tell you to keep hope up because I haven't been in this situation as long as you have. I'm still hopeful. But, I do know you. I'm always here if you need anything, but I believe that you are strong enough to surpass anything the world can throw in your path. Not to exaggerate, or make your head big, but you're invincible. The world can't touch you unless you let it. You cry and whine about wanting to be part of this country, but at the same time you post pics of defaced American flags? Do you have any idea the message you are sending by posting that image on your blog? especially by not specifying where you took this pic? one will only assume. Just because somebody sells these flags does not make it acceptable. You have absolutely no pride in who you are and where you came from, so you will never understand what it feels like when you see foreigners try to destroy your culture, as seen in your pic that "you didn't take at the rally". If you don't understand how wrong it is to publish such an image then you are not welcomed in this country. First of all, sweet !!! I have readers hating on my blog. That means people are reading it and I have a readership beyond my friends lol. Awesomeness. Thank you for validating my blog. After all these years of writing I never once got negative comments until now. I finally made it. :-) With that being said, thank you for your criticism of my ideas and of the picture I took. As I wrote earlier, I don't agree with that flag either but I like what it's doing, making people think about how other people see things. It's only in engaging in debate and conversation that we can learn and understand the why of things and learn something about ourselves at the same time. You don't know me beyond my writing here, so I don't atke your comments personally. If you knew me you would love me. We would be the best of friends and hang out all the time. But none the less, thanks for your response readers, you made my day. Ohhhh and before I forget, "You have absolutely no pride in who you are and where you came from, so you will never understand what it feels like when you see foreigners try to destroy your culture, as seen in your pic that "you didn't take at the rally"." Hahahahaha that's funny. Because us Mexicans don't know ANYTHING about foreigners destroying OUR culture. Hahahah ahhh that cracked me up something good. But to answer you, like superman, I am proud to call my adoptive country home. I don't steal, kill or do anything counter productive. I do my best to live my life like everyone else and learning not to litter soo damn much. Thanks again for your input. well said, random hero. the reader with the american flag problem deliberately ignored your disclaimer. anonymous fails to see in the representation the desire for unity between two cultures that are undeniably linked. for anonymous and those alike, i say that conservative american dogma has done an excellent job with you. Let the haters hate and let their ignorance surface it's all good. You don't even have to stoop to their level and explain anything. Let them assume and point fingers...that's all t hey know how to do anyway! If the "authorities" really cared about someone placing images of defaced American flags on their blogs, propaganda sites like Alipac, Digger's Realm, and World Net Daily would've been dealt with a long time ago. Kick rocks, trolls. Random, great post. I wish I could've made it out there to show support. 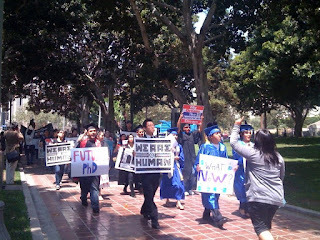 Question: is that picture of people carrying "We Are Human" signs from the graduation? Awesome post! Had to borrow a photo for my blog, hope you don't mind. I may not agree with the flag, but i sure as hell agree with you. 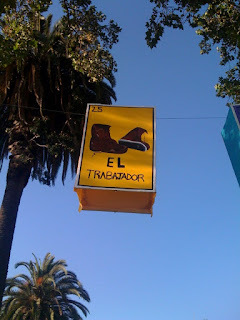 mada a chiflar a estos alipacers!! Look at you mr. popular! If journalists report on racism, does that make us racists? You saw something that caught your eye and the journalist in you said: "hey, people feel like this, you should know this." Good for you sir. Long live the fourth state!